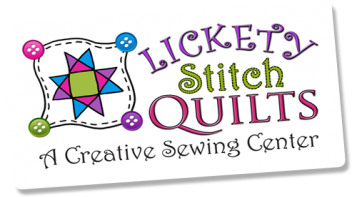 Lickety Stitch Quilts is a full-service fabric and sewing store located in Lusk, Wyoming. We carry many quilt-shop quality 100% cotton fabrics, minky cuddle 100% polyester in many colors and patterns, many quilting patterns and books, notions, and gifts, as well as finished quilts. We also offer sewing and long-arm machine quilting services. We special order products that are not in stock for our customers. Lickety Stitch also offers sewing and quilting classes. Specialties of the shop include licensed Wyoming Bucking horse and Cowboy products, fabric and kits. We have a large selection of western prints and many bolts of Minky as well. Please stop in at the shop if you are ever in eastern Wyoming. Also visit us often online, as our product line is ever expanding. We will be adding products regularly to the webstore. Give us a call if you are looking for something specific. We have many products that are not listed in our website. However, we are often open earlier and later than the stated hours. If you need to shop outside of these hours, call us and see if we can arrange it.